When reading a while back about UFOs, it always stuck in my mind that on New Year's Day in 1254 the monks at St.Albans in England sighted 'a kind of ship flying' in the sky that was 'large, elegantly shaped and of a marvellous colour.' The UFO phenomenon isn't something new. I thought, for a change therefore, we'd look at a dozen of the UFO visits from the distance past. 1504 BC: This is probably one of the earliest written accounts of a UFO - the following description is an excerpt from an Egyptian papyrus under the reign of Thutmose III. 'In the year 22... sixth hour of the day... the scribes of the House of Life found it was a circle of fire that was coming in the sky... it had no head, the breath of its mouth had a foul odour. Its body one rod long and one rod wide. It had no voice... Now after some days had passed, these things became more numerous in the skies than ever. 500 BC: In the ancient Indian text Samarangana Sartradhara there is a description of piloted flying machines called vimanas. These were powered by some unknown source and they could 'carry death' to anywhere on earth. 214 BC: This time in Italy at Hadria 'an altar in the sky' was seen. 584: St. Gregory, the bishop of Tours in France, recorded various sightings in his Historia Francorum. 'There appeared in the sky brilliant rays of light which seemed to cross and collide with one another.' He also described 'golden globes' which flashed at speed across the skies of France. 1170: Roger Niger described 'a wonderfully large dragon' which was 'borne up from earth though the air. The air was kindled into fire by its motion and burned a house, reducing it and its outbuildings to ashes.' This was seen at Osyth, Essex, England. 1180: In Japan something similar to a flying saucer was seen, though they described this as a flying 'earthenware vessel.' The object or UFO was heading in a northeast direction from a mountain in the Kii province. This suddenly changed direction and vanished below the horizon, leaving a luminous trail. 1290: The monks at Byland Abbey in Yorkshire spotted a 'large round silver disk' passing through the skies. 1561: This time the sighting was in Nuremberg in Germany where it was said that there was 'a very frightful spectacle.' 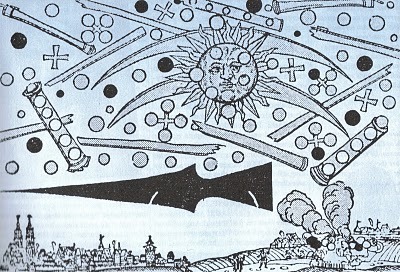 During daylight glowing tubes, globes and crosses were seen in the sky and appeared to do battle. This lasted for an hour and some then fell to the earth as 'if on fire.' The image at the top of this post refers to this. There are many, many other UFO sightings on record from the distant past. We sometimes seem to think of such things as a modern phenomena, probably starting with the Kenneth Arnold flying saucer stories from 1947. But very little in life is actually new - much has already been seen or experienced previously by past generations.